Dean's Award Exhibition 2015: The Winner is Daniel Carstens, B Tech Industrial Design. On display at the FADA gallery until 12 February 2016, is the body of work of seven finalists, nominated for the 2015 Dean's award. They include Daniel Carstens (Industrial Design), Daniella Ferreira Gil (Visual Art - Fine Art), Mariambibi Khan (Jewellery), Dewald le Roux (Architecture), Shivi Rastogi (Multimedia), Zanne de Meillon (Fashion) and Jessica de Sousa (Design Communication - Graphic Design). The winner by unanimous decision was the industrial Designer Daniel Carstens - artist statement and images featured below. 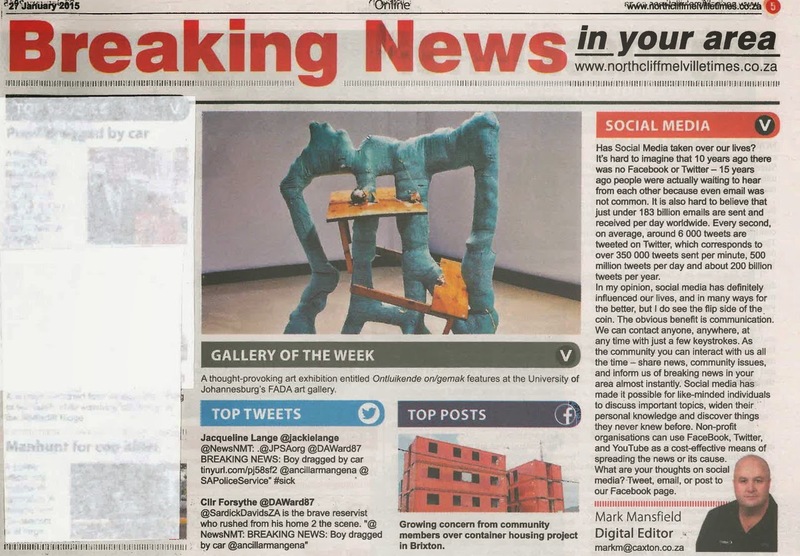 The announcement was made at the opening of the FADA Annual Student Exhibition at the end of last year. The exhibition will be annual event and feature the best work produced in the Faculty during the academic year. The present exhibition's run is extend to provide first time registering students the opportunity to view the work during their week of orientation. 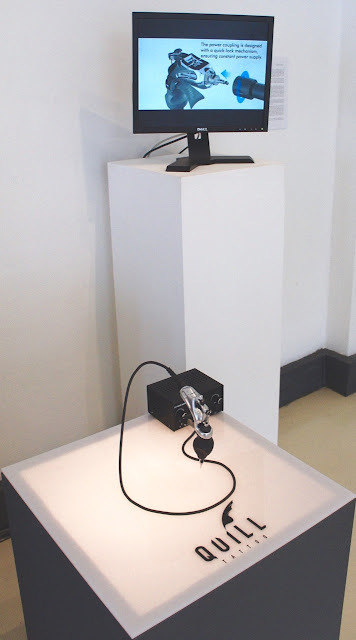 However the gallery is open to the public; Tuesdays - Fridays 09:00 -16:00 and Saturdays from 09:00- 13:00. 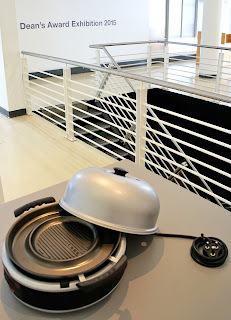 This body of work embodies the diversity of my BTech Industrial design portfolio. The Industrial design process presents the opportunity for innovation through the development of products for real-world application. Each design outcome illustrates considered design thinking in addressing the needs of specific product users. My ethos throughout each design process was to challenge the limits of technology, materials and manufacture to realise design outcomes that truly place the users’ needs at the core of the product. 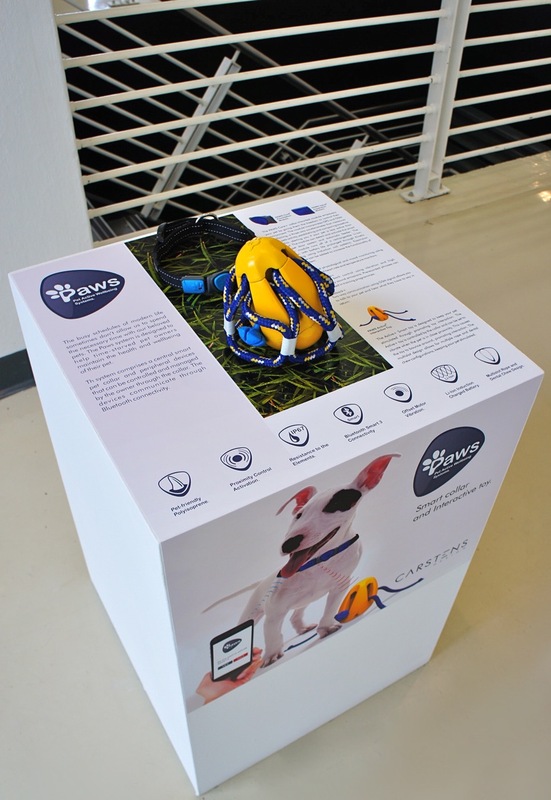 The PAWS interactive dog toy and collar addresses the need for time-starved pet owners to maintain the health and well-being of their pet (left image). 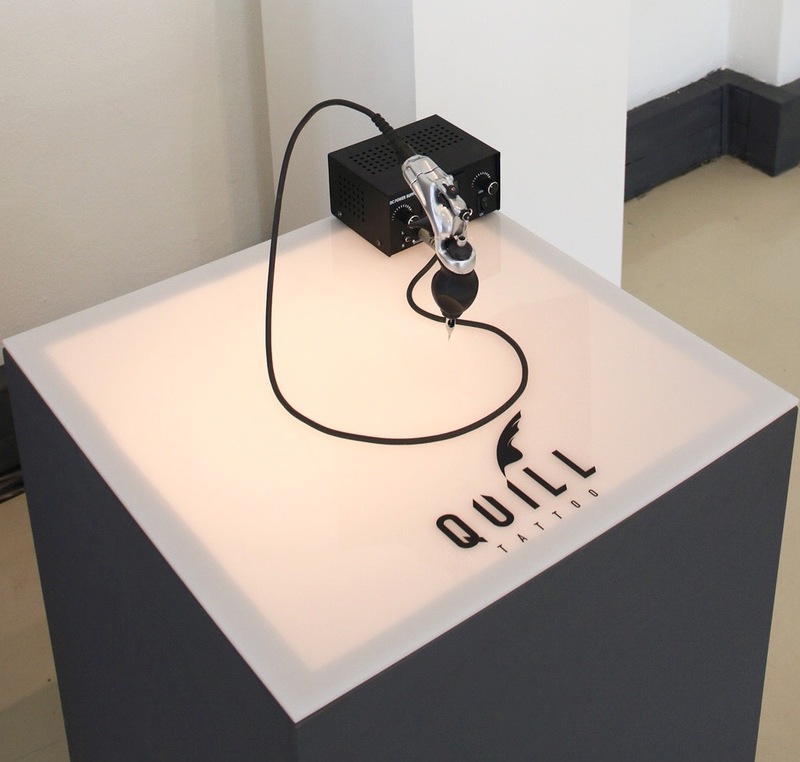 The system employs the technological advancements in connectivity to stimulate interaction and reinforce companionship. The nature of the product afforded the use of playful forms and colours to create a product that would be suitable for both pets and their owners. The Deka multi-functional concrete furniture (image above) adopts a human-centered design approach, considering the needs of the Gift- of the Givers initiative at the University of Johannesburg’s Doornfontein campus. The design thinking was to develop multifunctional seating that could accommodate over 400 students in a disused parking lot, reinventing the space as a communal hub for students. 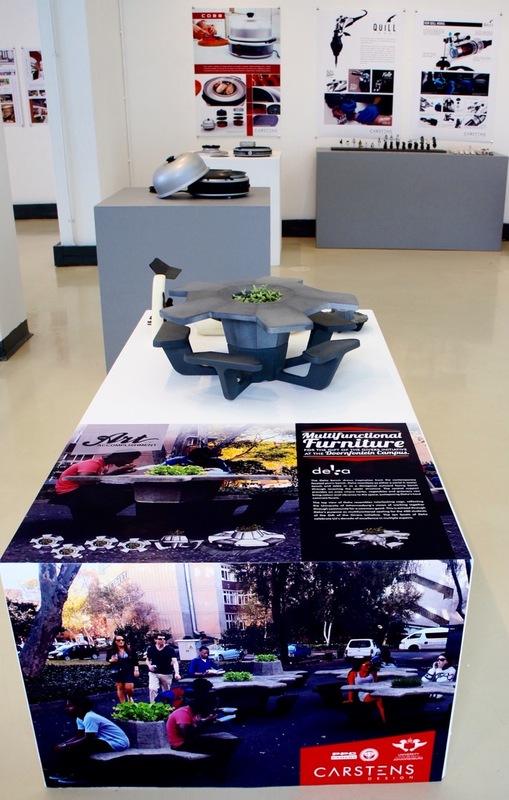 The design outcome draws inspiration from UJ’s celebration of a decade of excellence through its decagonal shape. The juxtaposition of hard concrete facets with greenery is symbolic of UJ’s celebration of diversity. The notion of diversity is further echoed through Deka’s multifunctional construction, where inverting the upper structure can provide either an intimate inward facing bench and table, or an outward facing bench for those looking for a personal space to utilise. The Cobb Induction cooking system represents the application of cutting edge heating technology encapsulated with a refined form that offers the sophisticated design language at the core of the Cobb brand. The design thinking employed the notions of versatility and functionality, focusing on user interaction and engagement. 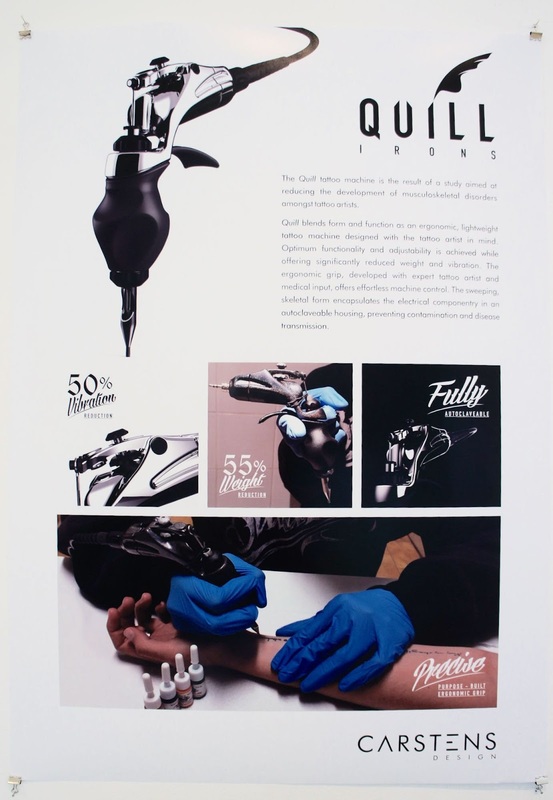 The Quill tattoo machine (title Image above) is the output of my dissertation study that is aimed at reducing the development of musculoskeletal disorders amongst tattoo artists. 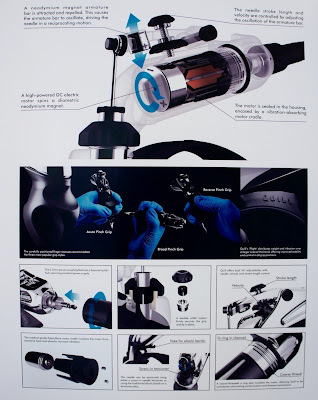 From a personal perspective as a member of the tattoo subculture, the notion that the existing tattoo machine was causing the tattoo artist’s pain, discomfort and even long-term damage elicited the need for the redesign of the tattoo machine. The design process focused on the reduction of the weight and vibration, while improving ergonomic considerations, cleaning and functionality. The ultimate aim was to give the artist the best tool for their trade. Aesthetic inspiration was drawn from skeletal forms, with sweeping lines and organic features challenging the conventional mechanical aesthetic. Through extensive research and process work, each design was transformed from a conceptual idea to a product that pushes boundaries through innovation, ultimately providing users with better solutions to their needs.